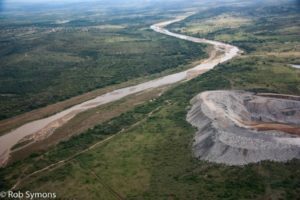 The Centre for Environmental Rights has intervened as a friend of the court in an application for leave to appeal a 2018 judgment where the KwaZulu-Natal High Court refused to stop a coal mining company from operating, and ordered the applicants to pay the mining company’s legal costs. The Global Environmental Trust (GET), the Mfolozi Community Environmental Justice Organisation (MCEJO) and Somkhele resident Mr Sabelo Dladla – seeking to vindicate their Constitutional rights, in the public interest – had applied for an interdict restraining Tendele Coal Mining (Pty) Ltd from continuing its coal mining operations at the Somkhele anthracite mine in KwaZulu-Natal near the border of the Hluhluwe-iMfolozi Park, because, they asserted, Tendele Coal Mining did not have all the necessary environmental authorisations required for its operations and it was therefore mining illegally. In early 2019, GET, MCEJO and Mr Dladla applied for leave to appeal the November 2018 judgment of the KwaZulu-Natal High Court. The Centre for Environmental Rights (CER) sought permission to intervene as a friend of the court or amicus curiae in the application for leave to appeal, because it is concerned that the judgment will provide mining companies with an excuse to operate outside of the law. The CER was also concerned that the adverse costs order against public interest litigants would discourage communities from approaching the courts to defend their constitutional rights through the fear of having to pay the costs of the opposing legal team. Tendele Coal Mining initially refused the CER’s request for its consent to intervene as a friend of the court. However, when the CER launched a formal court application, Tendele Coal Mining abandoned its opposition on condition that the CER does not adduce evidence. After CER’s intervention, Tendele Coal Mining also abandoned the costs order granted against the applicants. CER attorney and Mining Programme Head, Catherine Horsfield says, “Recently, the Constitutional Court has had occasion to criticise lower courts that had overlooked the Biowatch principle that affords public interest litigants protection against negative costs orders, precisely because of their chilling effect on rights. It has reversed two decisions of the Supreme Court of Appeal on the question of costs alone. The parties await a date for the hearing of the application for leave to appeal.